Over the years, I’ve spotted a few movie reviews which have been taken out of context and used by the films’ marketing teams to promote a film which the reviewer didn’t care for. This began with a commercial for Matthew McConaughey’s movie “The Lincoln Lawyer”, which touted a quote from film critic Richard Roeper wherein he said that the film “piles on the twists and turns”. Realizing that that doesn’t exactly sound like a rave, I went to the source. The full quote Roeper gave? The Lincoln Lawyer piles on the twists and turns, and then it ends abruptly, before all of our questions are really answered. Ouch. That is actually a pretty damning review. Roeper gave the film a “B” overall, but for some reason the ad chose to selectively quote one of his more cutting lines. And his story is so gently affirming, it might just melt the heart of a Ukip MEP. This, presumably, applies to Jim Broadbent’s white-haired antique dealer, who came to the UK on the Kindertransport, and to the beaming Afro-Caribbean musicians who play outside on the street. But it also, of course, applies to Paddington himself, another modern-day migrant in search of a new life. Paddington stows away on a ship in order to access the UK. He is then housed and fed by British taxpayers. So far as I could tell, he has no intention of finding a job for himself. But so what, who cares? He adds to the mix; we are lucky to have him. And his story is so gently affirming, it might just melt the heart of a Ukip MEP. The rather lukewarm three-of-five star review closes on a rather bizarre note about immigration and cultural integration. Perhaps the simplified quote is best after all. That’s a lot of top-notch reviews, right? Then again, it’s unclear what scales these reviewers use, so many of these could be four-out-of-five star reviews. Hell, it’s even possible some of them are out of ten stars. But to see something truly audacious and honestly, rather brilliant, have a look between the ears of the two Toms Hardy. 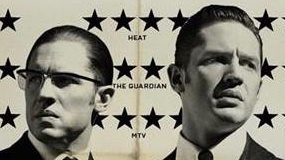 The Guardian did in fact give the film a two star review! 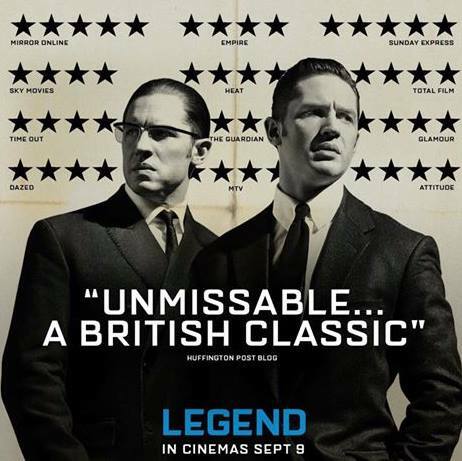 That is some bold design right there, and it would be impossible to accuse the poster’s creator of lying. Even the reviewer in question, Benjamin Lee, had to express his awe.